On another thread Martijn posted this link to an IQ test. Sorry, I haven't done that test myself. PS. During my psychology study (about 15 years ago) I have done one official IQ test resulting in a score just above 130 (but not as high as 136); in other tests my results were usually between 125 and 130. Oh sorry it's not an IQ test, just a "brain workout." anyone else going to try? Lynn wrote: Oh sorry it's not an IQ test, just a "brain workout." I am very dubious about using skin ridges for measuring IQ. Apart from understanding how they may be related to IQ I have another problem. Skin ridges are genetic and are not due to the environment. IQ depends on both so, at best, an estimate of IQ by examining skin ridges would be very rough. The ADT angle is likewise genetic, I think. It largely depends on the shape of the hand. This means that long palmed people are generally more intelligent (?). This makes it hard for square palmed people to be very intelligent. I know plenty of square palmed people who are quite intelligent. I have a Batchelor of Engineering degree, a Master of Science and a PhD and worked as a Senior Research Scientist in CSIRO before becoming an Associate Professor at QUT so I claim to have at least average intelligence but I have square palms. It is time to either drop this assertion or to check it out by comparing palmistry IQ with normal IQ tests. By the way exactly how are you supposed to measure IQ from the skin ridges apart from using the ADT angle? PS. 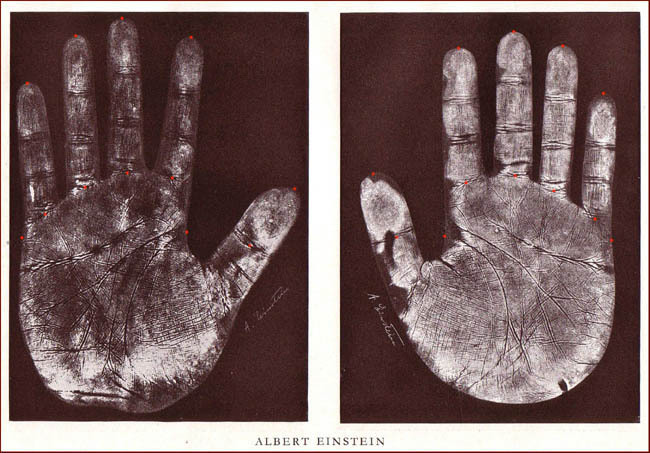 Finally, for example Einstein had 'square' palms... but his 'hand index' was pretty low (especially for his left hand), so one should better not try to mix the usually not very well defined 'palmistry concepts' with the more precise scientific measurements. For example: the 'square palm' has never really been defined in the palmistry literature - while a conscientious observer will notice that almost every palm has a rectangle shape because the palm length nearly always extends the palm width in both hands of almost very person...!!! Please... we are ... because Lynn's topic is about IQ tests not related to hands, so let's continue our sidewalk-discussion in one of the other topics that I have just mentioned. I first ran across Mensa in the 80s in a then popular magazine called "Omni". I have always had issues with multiple choice tests. The most annoying of them (for me) have D) None of the above, E) All of the above, as possible responses. I mean, why not include F) Some of the above, and G) Almost all of the above? As a kid I was always getting caught up in the grammar used to pose the question. I invariably ran into questions that I would think "..but what about this or what about this other possibility." I see this format of testing as being very american and just makes the grading of tests by teachers much easier. It means that the teacher may in fact not know anything at all. They simply have the proper responses provided for them on a cheat sheet from some other back room educator who makes up tests for a living. I much preferred the learning/testing experience I had in my last two years of high school in Ireland. You had to show that you knew something. Guesswork was not really an option. I took this test and got 27, but now I'm annoyed. I did not even bother with the INSATIABLE question. I'm kicking myself on this one because I have seen it before. I should have remember. I find it funny that the word/answer is something that I am just not interested in. I missed the typists question. I would have rather seen the question posed as: If two typists can type two pages in two minutes .... as .. If two typists can type a total of two pages in two minutes..... To my way of thinking that is a more intelligent question. Their question is just a trick. And I missed the serious question regarding their pictograms of petals and lines. This kind of thing is very Mensa-ish. Yes I can see that the number of petals change. And I could see how the lines worked. But something else is going on the those series. On the top row, moving left to right, the center solid circle shrinks a little bit. And the question itself talks about "... the line of drawings...". Line of drawings? Looks more like a matrix to me. In this case, the correct answer's drawing is to me of very poor quality. Extremely annoying. Anyway, the topic of methods of testing and forms of tests is very interesting. I am glad I saw this post as it has reminded me that I used to have issues with this.